Fraunces Tavern, one of the first buildings to be designated as a New York City Landmark in 1965, was originally built in 1719 but was controversially reconstructed in 1906 in an attempt to restore a colonial appearance. In 1906, the Sons of the Revolution hired architect William Mersereau to “restore” the building to its colonial appearance. They planned to revive it as a tavern and make it the society’s headquarters. Efforts were made to research the original structure and salvage any original material, however, little information was found. Not even a picture was available. The “restoration,” therefore, was a highly speculative one, almost an entirely new construction based on a conglomeration of examples from the period and clearly influenced by the Colonial Revival Movement so popular at the time.12 Throughout the 1940s, ’50s and ’60s, the Sons of the Revolution purchased four abutting buildings: 58 Pearl Street, 101 Broad Street, and 24 and 26 Water Street, which became a part of the museum complex. Fraunces Tavern was one of the first buildings to be designated as a New York City Landmark in 1965. Fraunces Tavern Block was designated a New York City Historic District in 1978. Since 1904, Fraunces Tavern has been owned and operated by the Sons of the Revolution as a tavern and colonial museum. In February 1904, the Board of Estimate decided against acquiring the surrounding block and plans for the preservation of the tavern were halted.19 Despite this, in May 1904, the Society of the Sons of the Revolution purchased the tavern. They then hired architect William H. Mersereau in 1906 to restore the building "as nearly as possible" to its former colonial appearance20 and make it the society's headquarters. What was promised to be a "restoration" of the deteriorated tavern became almost entirely a "reconstruction. "26 Criticism of the project was sharp and immediate. A letter to the editor of The New York Times from 1906, describes the work done on the tavern as a "scoundrelly piece of vandalism," the writer accuses Mersereau of "deplorable destruction" and asks: "How can men or women, who are pledged to preserve evidences of our country's history, give their consent to so much destructive work? "27 Despite mounting criticism, the Sons of the Revolution reopened the building as a tavern and colonial museum, with their headquarters atop, on May 1, 1907. The ardent criticism that began during the 1906 reconstruction continued to be impassioned for the greater part of the century. As the reconstruction became more and more a thing of the past, more and more of the public began to erroneously regard and accept Fraunces Tavern as an authentic colonial structure. This fact, along with a new trend for reconstructing 18th-century buildings while 19th-century buildings were being demolished at an increasingly alarming rate, sparked a fury among architectural historians and preservationists, who railed against these false interpretations through articles, letters to the editor, and other publicized methods. Ada Louise Huxtable, former architecture critic for The New York Times, was among those at the forefront of this dispute, using her column as an arena for preservation debate. In her 1965 article, "Lively Original vs. Dead Copy," she describes Fraunces Tavern as neither "old, nor authentic, nor preservation. "28 She begs for the tavern to be presented as what it really is: "a modern copy created by scholarly guesswork on some old bones" that possesses "some associative historical usefulness," and she condemns the assertion of the building as "original" to be "a serious error. "29 In other examples, she berates the act of reconstruction as a "perversion," a "fakery," a "make-believe" and reminds her readers that the whole point of preservation is not to recreate the past, "a laughable impossibility filled with booby traps," but to retain the buildings of the past so that they can remain a "part of the living heritage of the present. 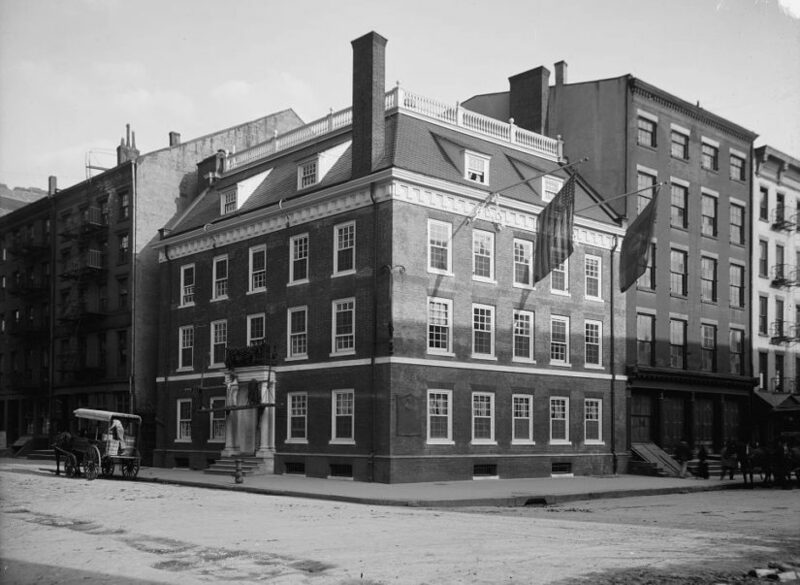 "30 Despite this criticism, Fraunces Tavern was one of the first buildings to be designated as a New York City Landmark in 1965. In the 1970s, the block surrounding Fraunces Tavern was threatened with demolition. In 1974, the Uris Corporation, owner of the buildings, moved forward with plans to replace several of the buildings with a parking lot.31 Faced with the loss of these buildings, the New York Landmarks Conservancy stepped in to halt the demolition. The Conservancy worked with the Sons of the Revolution "to organize a feasibility study of preservation possibilities" and to find an alternative to demolition.32 In 1978, the buildings on the Fraunces Tavern Block were saved when the New York Landmarks Conservancy purchased them.33 The transaction was possible due to a grant the Conservancy received from the Astor Foundation and a generous deal from Warner Communications. After the block was saved and the deeds transferred, the New York City Landmarks Preservation Commission designated it as an historic district in 1978. Norvell White and Elliot Willensky, AIA Guide to New York City: The Classic Guide to New York’s Architecture (New York: Crown Publishing Group, 2000). William H. Mersereau, “How Fraunce’s Tavern was Restored,” The New York Times, 17 March 1907. ”Old Fraunce’s Tavern,” New York Tribune, 29 July 1890. Benson J. Lossing, “Historic Houses of America,” Appleton’s Journal of Literature, Science and Art Vol. 11, No. 272 (4 June 1874). ”Fraunce’s Tavern Restored, Dedicated,” The New York Times, 5 December 1907. William S. Baker, “Itinerary of General Washington From June 15, 1775 to December 23, 1783,” Pennsylvania Magazine of History and Biography Vol. 15 (1891). ”Fire Damages Room at Fraunce’s Tavern,” The New York Times, 1 July 2001. ”May Hide Dark Secrets of Fraunce’s Tavern,” The New York Times, 20 May 1904. ”Old Fraunce’s Tavern,” New York Tribune, 20 July 1890. Ada Louise Huxtable, “Fraunce’s Tavern Controversy,” The New York Times, 6 June 1965. New York City Landmarks Preservation Committee, Guide to New York City Landmarks, 4th ed. (Hoboken: John Wiley & Sons, Inc., 2009). ”Holland Society Tablets,” The New York Times, 30 September 1890. ”Fraunce’s Tavern,” The New York Times, 30 May 1902. ”Fraunce’s Tavern Protest,” The New York Times, 23 January 1903. ”Fraunce’s Tavern: Arguments For and Against Purchase of Sufficient Land Around It For a Park,” The New York Times, 7 February 1904. ”No Fraunce’s Tavern Park,” The New York Times, 27 February 1904. ”Sons of the Revolution Buy Fraunce’s Tavern,” The New York Times, 19 May 1904. T. S. Affleck, “Letter to the Editor: Renovation That Leaves No Vestige of the Original Building,” The New York Times, 15 September 1906. Ada Louise Huxtable, “Lively Original vs. Dead Copy,” The New York Times, 8 May 1965. Ada Louise Huxtable, “Where Did We Go Wrong?” The New York Times, 14 July 1968. Fraunces Tavern Block Historic District Designation Report, 14 November 1978. Ada Louise Huxtable, “Architecture: The Bulldozer Approaches a Historic Block,” The New York Times, 14 July, 1974. Donald G. McNeil, “Five Historic Manhattan Buildings Sold to Restorers,” The New York Times, 6 May 1978.